Mageworx highlights eight core Magento 2 SEO features. First of all, it is the usage of rel=canonical URLs for the category, product, and layered navigation pages that improve your current store ranking. 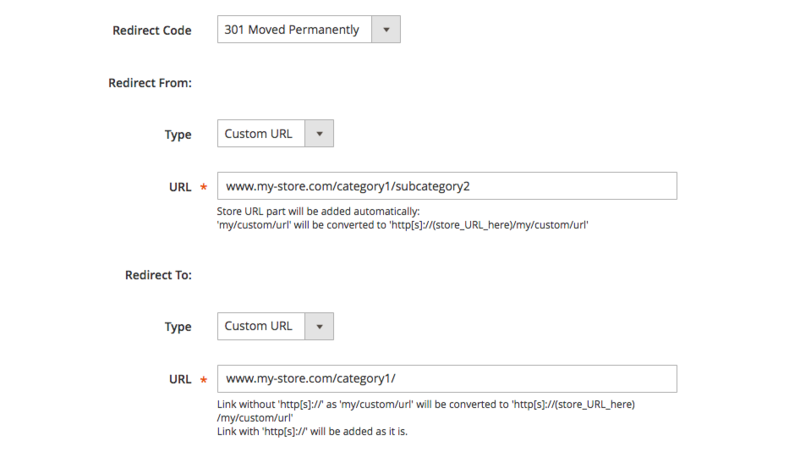 Another important aspect of this Magento 2 SEO extension is cross domain canonical URLs. Along with robots meta tags, they also provide a positive influence on your position among other search results. Besides, you get individual Magento 2 SEO settings for all products and categories available on your ecommerce website. This SEO Magento feature helps to implement SEO improvements more precisely. Another notable function is related to Magento 2 SEO templates that are designed for the seamless optimization of meta data and store descriptions for product, category pages and the pages filtered by layered navigation. Advanced HTML sitemap, extended XML sitemap settings, and rich cross linking capabilities are mentioned as top features of the Mageworx Magento 2 SEO Suite extension as well. On top of this, the extension has a bunch of simple, yet really important SEO features that allow you to optimize site breadcrumbs, elements of paginated pages, page URLs of a different type, and set up custom redirects and redirects for the deleted products. If you are not familiar with canonical URLs, let’s make a brief excursion. A canonical link element is an HTML element designed to prevent duplicate content issues which are typical for ecommerce websites. By specifying a “canonical” web page, you chose its preferred version shown to search engines. As a result, your Magento website becomes more SEO-friendly. In ecommerce, it is natural for the same content to be accessed through different URLs. The same product page gets dynamic URLs due to the way a customer behaves on your website. Your online store visitors can use various filters while trying to find the desired item. As a result, you might face the problem of duplicated content. disabling canonical URLs for pages with NOINDEX robots. Besides, you can easily point your layered navigation pages to either a filtered page or a current category. All these improvements fundamentally strengthen the default SEO potential of Magento 2. When you perform a Google search, a search engine checks its index (massive storage of data) to determine the most relevant results, which will be returned to you. This process is based entirely on crawling, indexing, and serving. Crawling is a process when Google sends its spider to your Magento 2 website to track its new and updated pages. 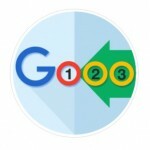 As for indexing, the core goal of this procedure is to put the obtained results on Google’s index. Googlebot processes each of the pages it has recently crawled to compile a massive index of all words and other information available on your website (their location also matters). the # of Layered Navigation filters to be forbidden from indexation. To avoid duplicate content issues on multi-language stores that can occur because of content localization, store owners should use hreflang tags. With the help of these tags, search engines understand better which language version of a page should be used as an alternative to the original page for a specific location. In this way, your foreign customers browse your web store in their language, while Google does not define localized pages of your website as duplicate ones. overview all alternate hreflang settings to check made changes quickly. There are two core types of sitemaps: HTML and XML. The first type helps your visitors navigate on your Magento 2 website more efficiently, but it is unsupported by search engines. That is why it is necessary to create an additional XML sitemap to improve your SEO. An HTML sitemap is a bulleted outline text version of the website navigation. A sitemap created in the XML format can be submitted to search engines to improve the effectiveness of crawling. With the help of a sitemap, you can provide search engines with information about your dynamic content, which cannot be crawled under default conditions. Besides, you improve your Magento 2 SEO results if your store is new and does not have many links to it. The same is about websites with archived content that are not well-linked. So, by helping your visitors to browse your site more efficiently, you also improve SEO. The Magento 2 SEO suite by MageWorx offer a bunch of advanced tools for creating highly-customized and Google-friendly XML sitemaps. With the extension, it’s possible to create XML sitemaps separately for different entity types: product, category, CMS as well as additional and custom landing pages. auto-disable URLs with specific literal characters. Also, with SEO Suite Ultimate, it is possible to generate sitemaps with the help of Magento Cron, as well as create them via Console. Although cross linking often refers to the process of linking between two sites, it also often covers the internal link building. Thus, cross linking allows you to point your visitors to the content similar to that which they are already viewing. As a result, you improve page ranking as well as get more engaged customers. Remember the way Wikipedia works: you open an article about cross linking, and after two hours you are already reading about Ancient Greek philosophy. Although it is impossible to link these two topics, Wikipedia points its readers from one article to another very smoothly, so you cannot even notice the moment when you have left the field of SEO. Select target cross links entity from category and product grids. 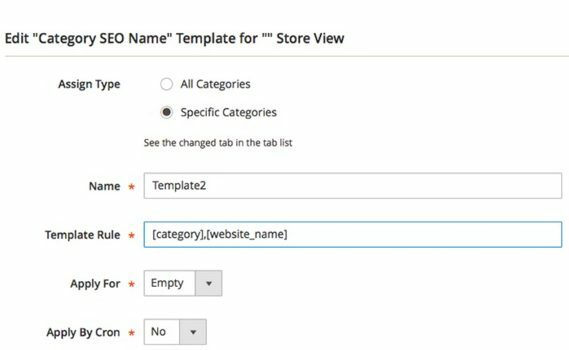 As for the extension’s category page SEO templates, they are responsible for such areas as Magento 2 meta title, keywords, and description; a category description; and a category SEO name. It is possible to optimize all categories simultaneously or any chosen categories. 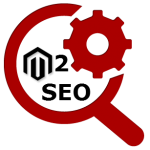 SEO Suite Ultimate also enables you to easily optimize a large amount of meta data and descriptions for pages filtered by layered navigation (aka category filter pages). With the extension, you can turn them into a fully-fledged site pages that have higher chances of ranking in Google. Such an approach will let you enhance your site architecture and produce more pages optimized for specific search queries and long-tail keywords. Using these templates, you can optimize LN pages’ meta titles, descriptions and keywords, as well as full page descriptions. 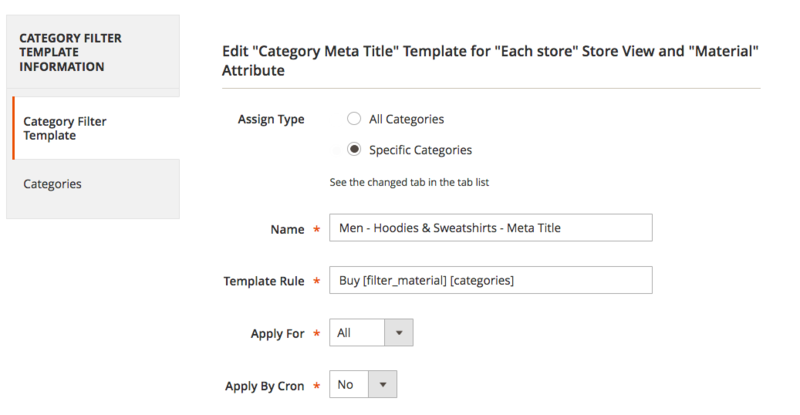 Both product and category SEO templates fully support Magento Cron and can be applied to any chosen store view. Each template can be tested and previewed with the Test-Apply feature. You can also mix similar attributes with the Attribute Randomizer feature to make them look more natural. SEO Suite Ultimate enables you to preserve valuable SEO link juice and decrease site bounce rate because of getting on the ‘404 Not Found’ page. FROM/TO any product/category/CMS page of your website. You can also set the time to keep redirects on the website, and manage them (disable/delete/edit) whenever needed. It may happen that your store categories have a big amount of products that spilt this category in multiple category pages. SEO Suite Ultimate enables you to optimize paginated page, and avoid potential SEO issues these pages may bring. With the extension, you can set the format of the pager URL key, define how these pages are marked in URLs, add a pager number to meta titles and descriptions. Well-optimized site navigation is one of the key ranking factors. Advanced breadcrumbs will help you improve your store navigation, and, as a result, make your site more search engine friendly. With SEO Suite Ultimate you can create custom-tailored site navigational paths. You can use shortest, longest or the default breadcrumbs paths and prioritize categories used in breadcrumbs, and more. Also, with the extension, it’s possible to enable breadcrumbs in rich snippets. There are a few updates planned for the Magento 2 SEO Suite in the upcoming versions. New features that will be added soon include SEO reports and tools for optimization image alt tags. Which functionality will come next? Leave your thoughts in the comments. As you can see, Mageworx offers a very reliable Magento 2 SEO extension which will significantly improve your website ranking. Store owners want to have their websites on the first page of search results, and the SEO Suite Ultimate module is designed to achieve this goal. Layered Navigation — to improve category filtering. The Magento 2 extension costs $299, which is quite a low price for a full-featured solution that will get more updates in the nearest future. Probably, it might be the best Magento 2 SEO extension, but you can also check some alternative solutions here: Magento 2 SEO Extensions.